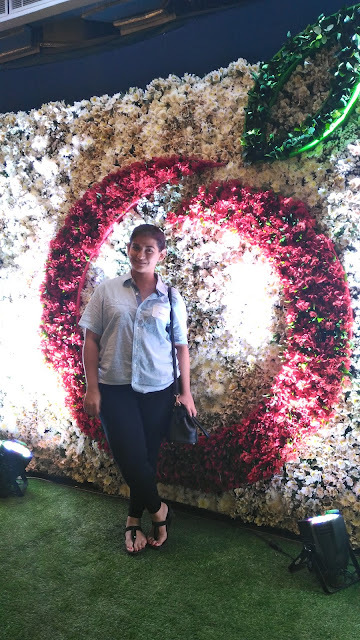 Grocery-chain giant Robinsons Supermarket opened its second Robinsons Selections store in McKinley Hill, Taguig City last November 27, 2015 in response to the growing shopping sophistication among consumers. They have a lot to offer, even gift packing services. 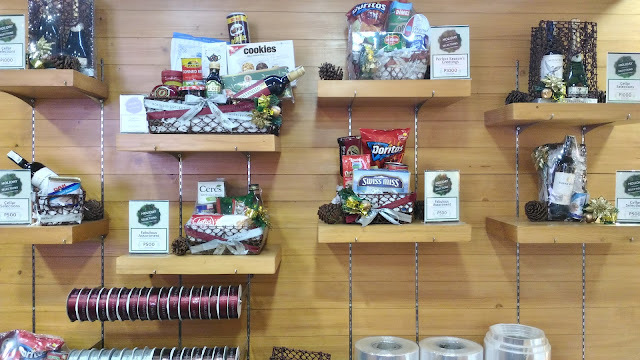 Here are the other things they offer at Robinsons Selections. I also got a couple of Hugs and Kisses. It was divine and oh so sweet. 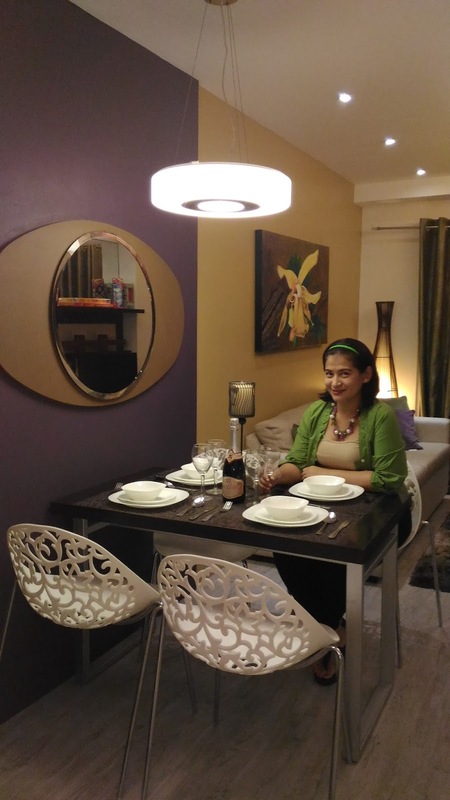 Robinsons Selections is bringing to the McKinley Hill community the same state-of-the-art design and top-of-the-line offerings as its predecessor, which opened last year in Eight Forbes, Burgos Circle, Bonifacio Global City. With a larger area of 2,481 square meters, the new store will feature a bigger food-to-go section with carefully curated gourmet goods for those with discerning palates. 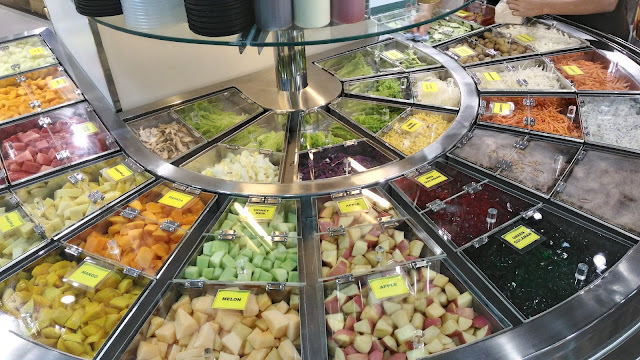 Robinsons Selections McKinley also offers a wider assortment of imported products and new sections in keeping with the commitment to bring fresh and healthy food. 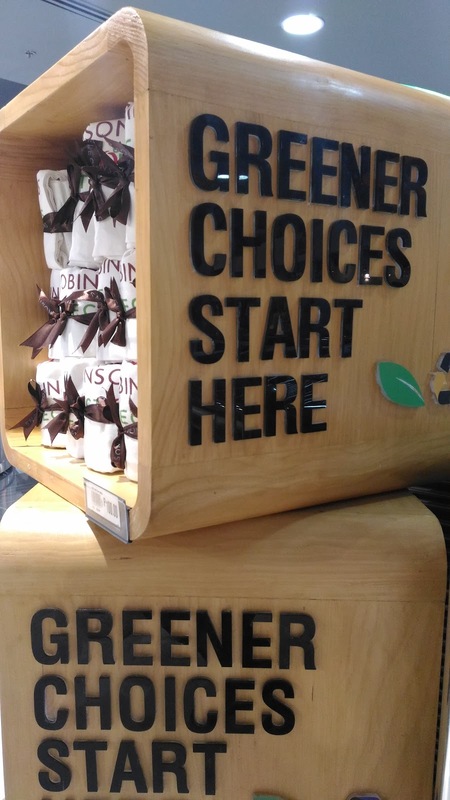 This is complemented by the store’s noticeably clean and hygienic ambience for a more pleasant shopping experience. The store takes pride in its new and unique Sushi Bar and Fruit Bar sections. It also reinforces its mission to become the premium shopping destination with its own Gift & Wrap section and Concierge. Robinsons Selections aims to be the grocery store of choice for discerning shoppers looking for fresh and healthy food and other needs which suit their shopping lifestyle. Visit its official website at robinsons-supermarket.com.ph and “Like” its Facebook page facebook.com/RobinsonsSelections. What does Nippon paint and LifeisKulayful have in common? Simple. We both love colors and I literally went into color heaven when I saw the new colors being forecasted for next year. Nippon Paint (Coatings) Philippines, a member of the Nippon Paint Malaysia Group, launched its second “Trend Beyond Colours”, unveiling nine key colour palettes featured across three inspirational palettes: “We Are One”, “New Eco” and “Wonder-Lust.” The nine colours are forecasted to drive utilisation across various industries and applications in 2016 and 2017. The nine trend colours were curated and handpicked by more than 50 design professionals, colour experts and enthusiasts from all over the Asia Pacific Region, including the Philippines, Malaysia, Singapore, China, India, Hong Kong, Thailand, Taiwan, and Japan, held at the Asia Pacific ChromaZone Colour Forecasting Workshop 2015 in Japan earlier this year. The Asia Pacific ChromaZone Colour Forecasting Workshop was organised by Colour Marketing Group (CMG), the leading authority in identifying, understanding and forecasting colour trends, in collaboration with Nippon Paint. It is the only convergence of Asian professionals to create an Asian Palette specifically for the region, and the forecasted colours form an important reference point that influences colours used across a wide range of industries from automotive, fashion to electronic gadgets as well as for architectural and interior spaces. 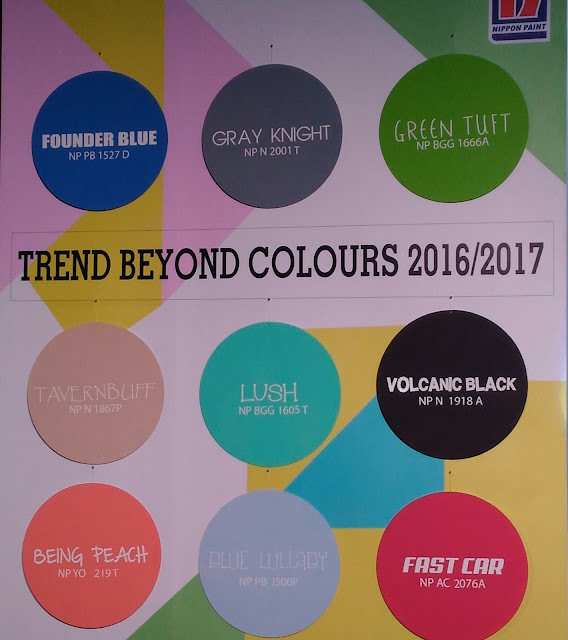 CMG and Nippon Paint held the first Workshop was held in 2014, resulting in the inaugural Trend Beyond Colours 2015/16. 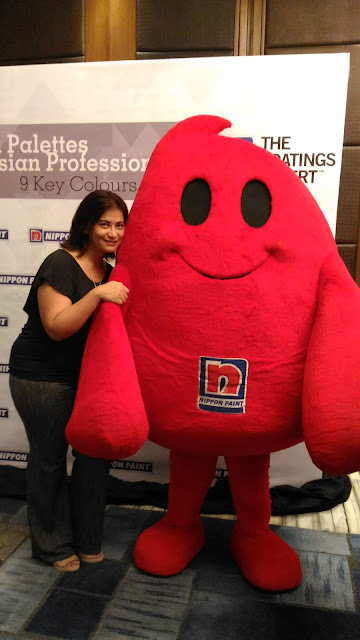 As the Number 1 coatings expert in the Asia Pacific Region, Nippon Paint has taken on the leadership role in working with interior designers and architects from across Asia Pacific in developing the Trending Asian Colour Palettes - a truly Asian Colour Palette made by Asian Professionals. “As the Total Coatings Expert, Nippon Paint continuously pushes the boundaries of paint and colours to pioneer and redefine the Asian palette, inspiring consumers to re-think paint and re-create possibilities on all surfaces. Colours form a very big part of the Asian culture and Asia is one of the fastest-growing continents in the world, both in terms of size and population, comprising almost two-third of the 7.0 billion world population. 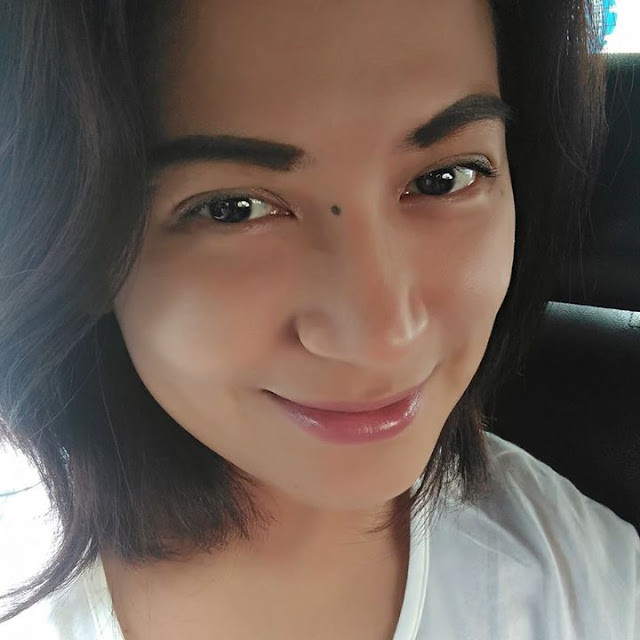 This further reinforces the reason why it is important that Asia forms its own unique colour palettes to drive the trend in terms of colour application or expressions,” said Michael Chung, General Manager of Nippon Paint (Coatings) Philippines. Understanding that colours can enliven the environment and mood around us, Nippon Pant has unveiled three colour themes - “We Are One, “New Eco” and “Wonder-Lust”. Each theme features three unique colours, allowing consumers to explore and express their imagination. The first series, “We Are One”, features modern colours reminding how new age technology and social media are constantly affecting our lives and keeping us connected wherever we are. The palette features Founder Blue (NP PB 1527D), Gray Knight (NP N 2001T), and Green Tuft (NP BGG 1666A), accentuating people’s connection in a world without boundaries where digital devices are an indispensable part of our life today. The second series, “New Eco” celebrates the wonders and simplicity of Mother Earth. Inspired by nature, “New Eco” brings consumers back in touch with the environment from its quietly stylish but ultimately comforting colours. The palette reinterprets Asia’s captivating nature, from the vintage soul of Asia to the serene oceans and mighty volcanoes personified by its three colours, Tavern Buff (NP N 1867P), Lush (NP BGG 1605T) and Volcanic Black (NP N 1918A). The third collection, “Wonder-Lust” embodies today’s YOLO or “You only live once” culture as it explores one’s discovery for the perfect balance in life through our continual search for new interests, hobbies, experiences and adventures. For consumers that aren’t afraid of some excitement in their life, “Wonder-Lust” is equally big, bold and bright in colours. The lively colours featured are Being Peach (NP YO 1219T), Fast Car (NP AC 2076A), and Blue Lullaby (NP PB 1550P). “To create these palettes, we have analysed the effects of colours and how behaviour is influenced by colour, fashion, retail performance, lifestyle trends and culture in today’s world. Nippon Paint’s Trend Beyond Colours will inspire consumers to create their own designer styles drawing on the three themes handpicked by our designers. The publication is packed with many photos and ideas, featuring our designers’ personal tips and recommendations on how the colour palette can be cleverly and innovatively applied on both interior and exterior surfaces,” Chung said. “Moreover, through Nippon Paint’s technological innovations, these colours can be coated to almost any imaginable surfaces including wood, tiles, cement, slate and glass. Consumers can also use these colours to mimic the look and feel of three-dimensional textures of stone, marble, velvet, or satin using the series of Nippon Paint Momento Special Effect Paint. Trend Beyond Colours 2016/17 is available for download online. To download or to read it online, please visit www.nipponpaint.ph. Lady's Choice has always been a staple in our home. It is our choice when we need to buy sandwich spread, mayonnaise, I don't even remember having any other brand in our refrigerator. It has always been Lady's Choice. After a three-month search for the best tasting dishes innovated using mayonnaise, Unilever Food Solutions (UFS) Philippines hails today the first ever winners of the Lady’s Choice Real Chef Challenge—a first of its kind culinary competition that challenges cooks and chefs across the Philippines to test their culinary acumen by revolutionizing dishes with the use of Lady’s Choice Real Mayonnaise. The culinary experts with the most irresistible Salad & Sandwich Combo and the most exquisite tasting Hot Dish win the crown. After the rigid scrutiny of the panel of judges, which included celebrity chef and executive chef of Chef Logro’s Institute of Culinary and Kitchen Services or CLICKS, Chef Pablo “Boy” Logro, owner and kitchen geek of Pino Kitchen Studio and Backyard MNL, Chef Edward Bugia, and UFS Senior Sous Chef, Chef Brando Santos, 25 interesting mayo innovations submitted from across the country have stood out. 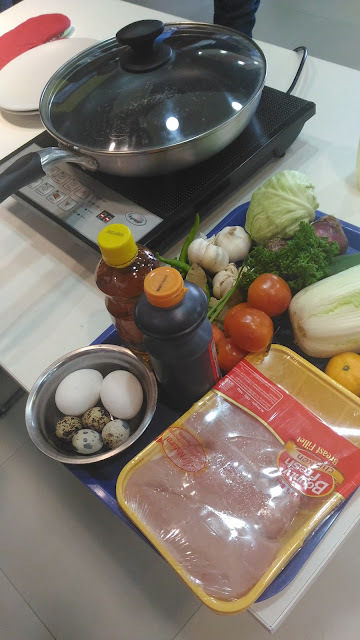 In a grand taste testing event held at Glorietta 3 Activity Center, the top 25 chef finalists prepared and served their dishes before the chef judges and the public to determine the dishes from the Salad & Sandwich Combo and the Hot Dish categories. Both categories were judged based on taste and concept, presentation, and how the use of Lady’s Choice Real Mayonnaise elevated the texture and taste of the dishes. 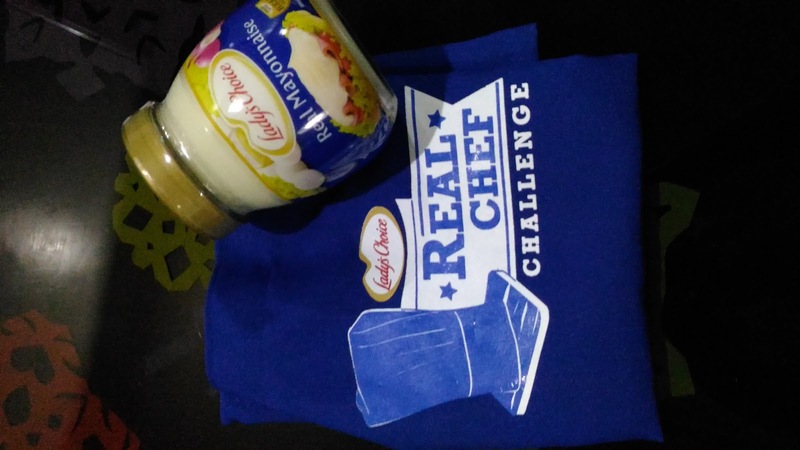 “The top 25 mayo innovations that have made it to the finals prove that with the use of Lady’s Choice Real Mayonnaise, there are just so many recipes you can create and the possibilities to food innovations become endless,” said Chef Joanne Limoanco-Gendrano, Executive Chef at Unilever Food Solutions. Lady’s Choice Real Mayonnaise is made of real ingredients that help enhance the flavor of dishes, making them richer. Its creamy texture and taste definitely add a distinct flavor that elevates the taste of dishes. Aside from showcasing various recipes that are made interesting with the use of mayonnaise, Lady’s Choice Real Chef Challenge also became a venue for the chefs and cooks to bring out their amazing talents and expertise in running their food establishments that are often not seen by the diners. Two winners of Real Chef Challenge brought home P100,000 each and an exclusive TV feature of their establishment and the winning dish. More than this, they also brought home the title of being hailed as the first-ever winners of the Lady’s Choice Real Chef Challenge. I have always been a lover of cofffe. Now notice that I said I am a lover of coffee and not an expert. I just like coffee but I have never really tried studying it or learning more about the beans and what not. I just drink it everyday and I drink a minimum of at least 3 cups of coffee. 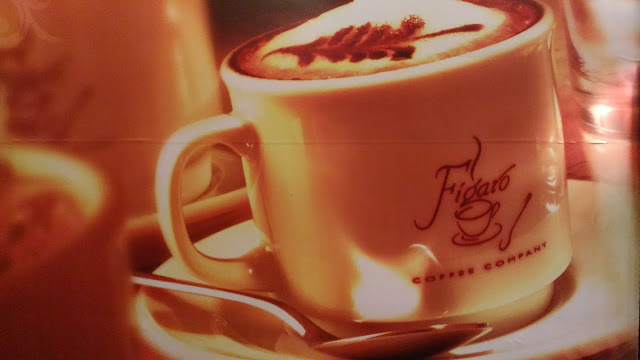 One of the local coffee shops that I have always liked is Figaro. They serve pretty good coffee. The only thing I can complain about is that the cup is too small but then again, I am the coffee drinker who drinks coffee in a beer mug. 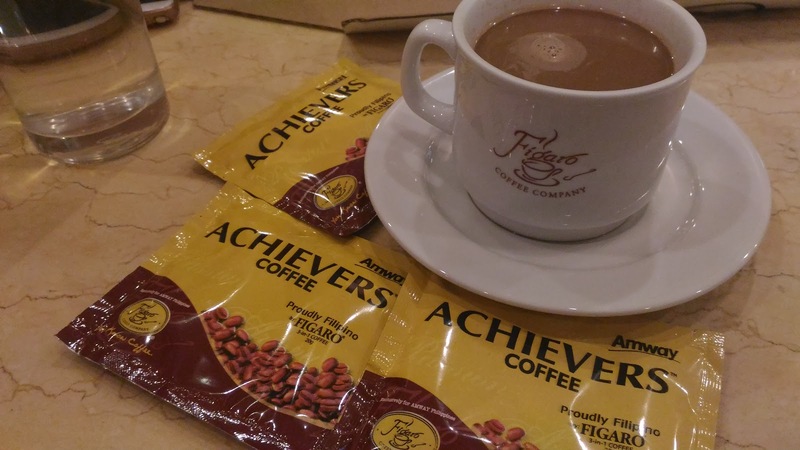 Recently, Figaro partnered with Amway Philippines. 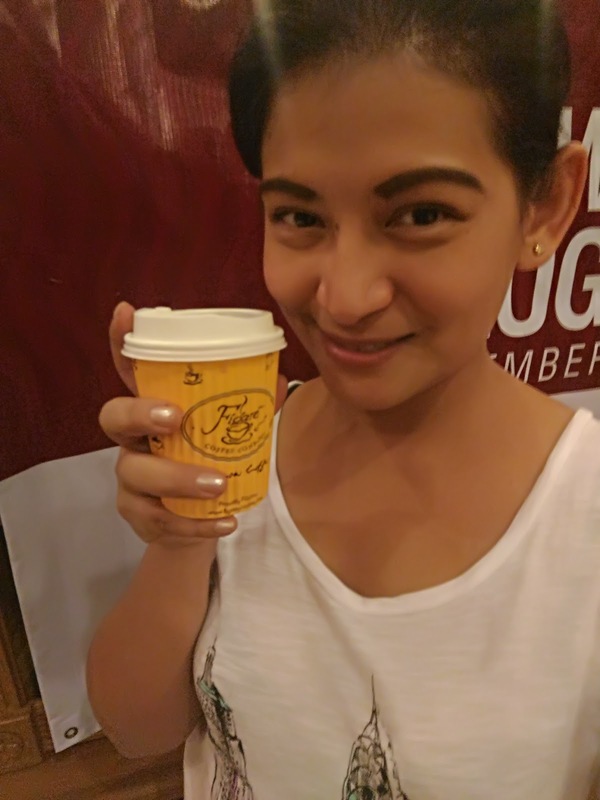 Together, they aim to serve better coffee with more health benefits for the coffee drinkers in the city. I was able to try the drinks they had and here are my thoughts on each one. The hot chocolate from Amway is very rich in flavor. It reminded me of the tsokolate de batirol and its richness. I quickly downed a cup of it and wanted more but I had to stop myself coz there were still more for me to try. This brown free-flowing powder contains sugar, cocoa powder, and milk powder with hints of sweetness and creaminess. This would actually make a perfect partner with bread among other things. Another good thing about this is that it can be stored for one year when stored in a cool, dry place. 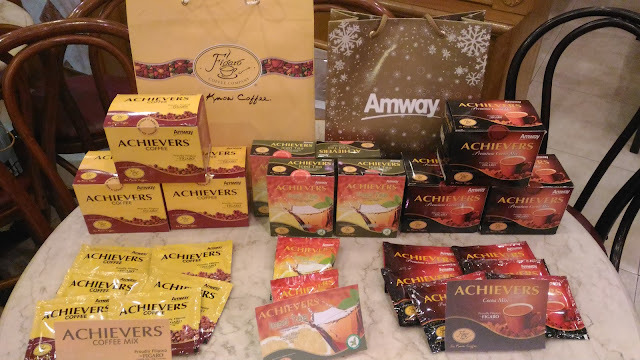 The Amway Achievers Coffee is a light, brown free-flowing powder that is meant to be drank hot. For people who like creamy coffee, this would be absolutely perfect. 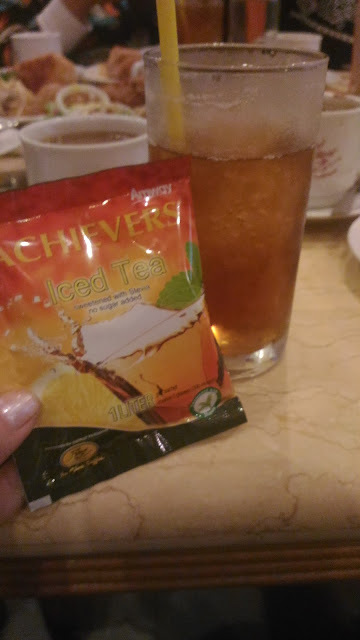 Now Iced Tea is one of the things that I have been staying away from but this real tea from Amway combined with flavors of lemon uses Stevia from Stevia Leaves which makes it healthier. It also has black tea powder which is good for the body. 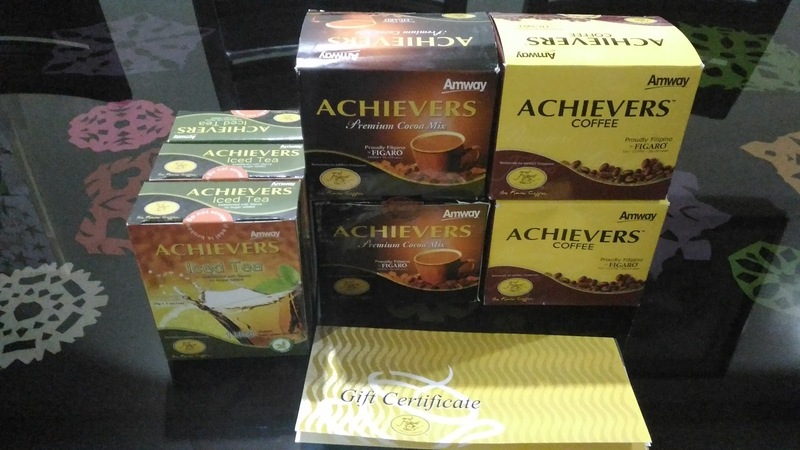 The Achievers Iced Tea is definitely a healthy alternative to your regular coffee. Now you don't need to feel guilty when drinking Figaro Coffee because you know that every cup is healthy and gives health benefits to you and to your body. To this I say, drink away. At some point, one way or another, when we know that the relationship we are in is about to end, we wished for this moment. One more day, one more chance, one more night. We ask for one more kiss, one more hug, one more touch, one more night of passion. 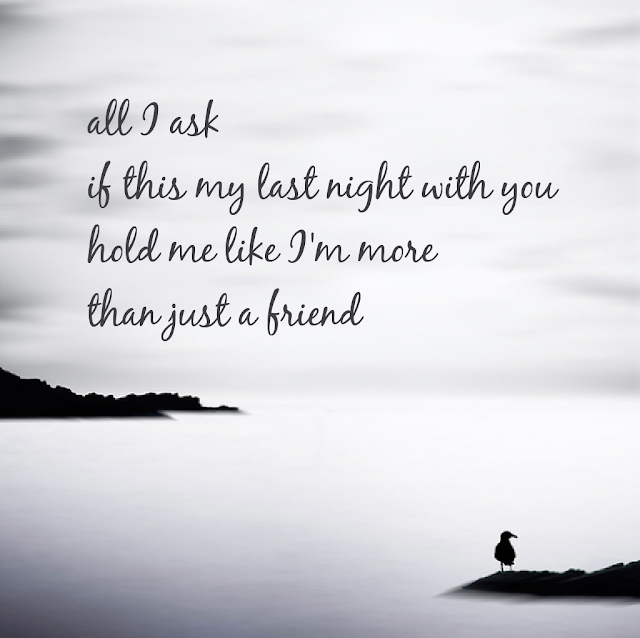 MU ... if I could have one more night with you, I would want to spend it lying in your arms. I never really got to experience this with you, just lying down, talking, with my head on your chest. I guess it was because we were too young and we never really had a moment alone all to ourselves. JM, I would sit down with you over dinner and talk. You were good to me. It just really became boring and tedious. We saw too much of each other and too little of the world. It just wasn't healthy anymore. I would ask to sit down with you and talk about life, goals, and what else we can do now that we are parting ways. The way we ended, it wasn't how I wanted it to end. RS, oh God, RS. You were the one that I let go. If I could have one more night with you, I actually don't know what I want to do. I'd probably just wanna spend it wrapped in your arms, sitting on top of a mountain, looking at the stars, and have you sing To Be With You to me again. I would want to have one more night just being with you. FM, we've had so many last nights together. For the last 3 years, every time we would see each other, it has been a last night. You didn't know it but when I saw you last at your hotel when you were sick, it was the last. In a way, it was perfect. You held me in your arms and I hugged you to sleep. You were very sick and I took care of you. I want that to be our memory of us. Bear, my dear YM, the most recent guy to break my heart. I wish that our last night was back in July before you left for the land down under. It would have been perfect for us. It would have been a wonderful memory between the two of us but you wanted more and now you have destroyed the beauty of our story. 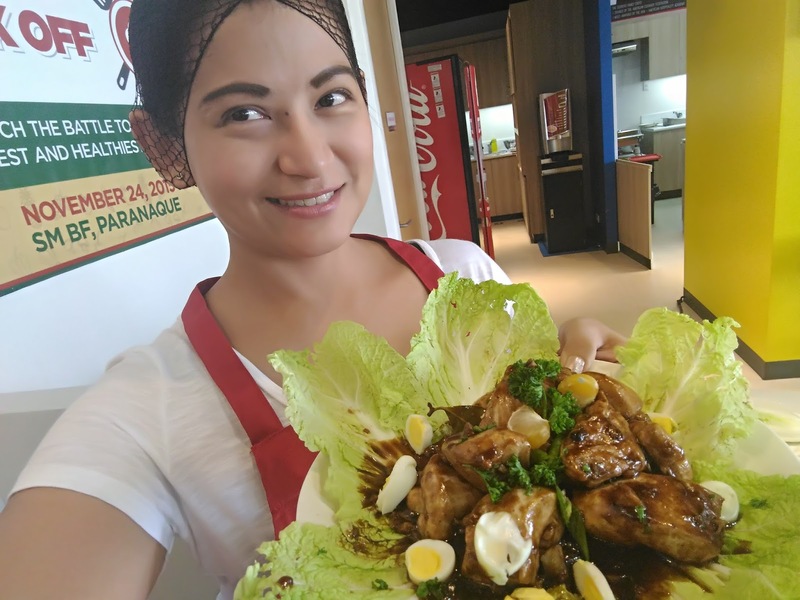 One of the things that most call center agents or personnel sacrifice is the quality of food. It is but normal to see someone working in a call center to have cup noodles for lunch or dinner. Sometimes, its fast food or food you can buy from a Jollijeep. 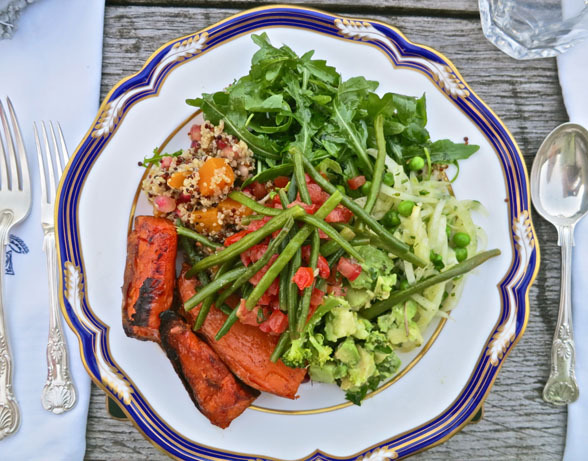 Yes they may earn a lot but when you work the graveyard shift, there really are no restaurants that would be open to cater to your needs for healthy food or healthy meal options. 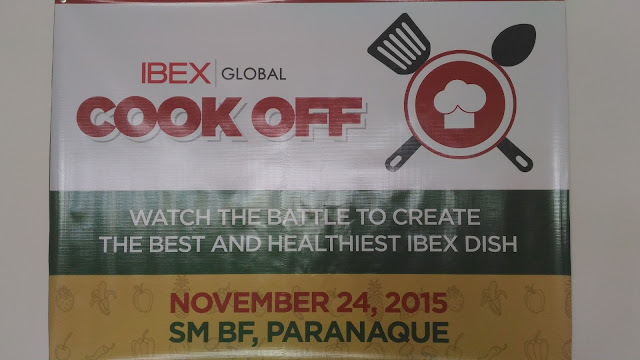 IBEX saw this problem and decided to address it by having a cook off for their staff and inviting some media personnel to cover the event which made it even more exciting for the staff. This event was the first of its kind for IBEX and I believe, the first of its kind in the BPO industry. We were in for a treat and a surprise when we got there because unknown to us, we were part of the actual cook off. This was the set that was meant for my team and I. It was quite thrilling, frustating, and a learning opportunity having to cook in such a short time with people you barely know. If you think about it, it's almost the same when you are expected to perform, get along, and hit your goals when you have just transferred to a new team in the BPO world. This is our finished product. It looks quite okay but trust me when I say there's room for improvement. What I liked about this activity is that you can really see the care that the company has for its people and coming up with healthy yet affordable meals for the staff is definitely something. One of the few things that I rarely get to eat is Mexican food. There's just not that many in the area and so its one of the few things that I get to have. Thankfully, Taco Bell is now back in full force and what's even better is that it opened near my place. Alert your taste buds southern Metro Manila! Taco Bell, the world’s leading taco food chain, opens its newest concept store at the 2nd Floor Activity Center of Alabang Town Center (ATC). Taco Bell brings the ‘Live Más’ experience to its valued customers by putting a twist to traditional Mexican cuisine, serving the best food quality at prices its customers love, and passionate top-notch service from the heart, all contributing to the brand’s commitment to feed’s people’s lives with ‘más’. 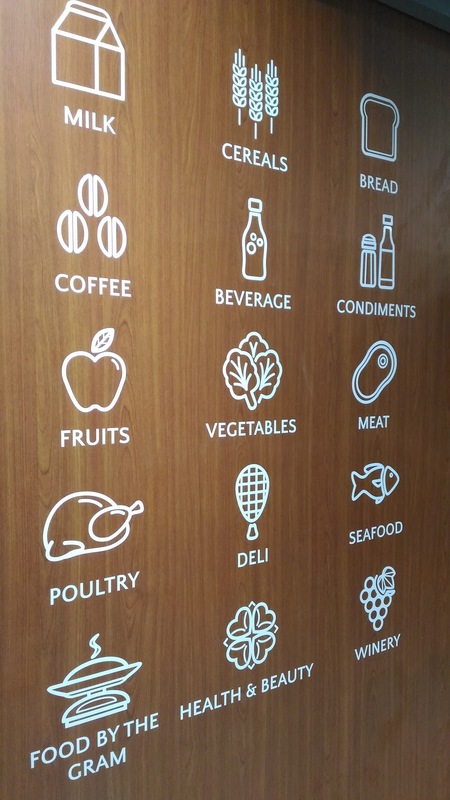 What’s more, the new concept store will also feature an open plated service making the food the star! Enjoy crunchy tacos, cheesy quesadillas, fully-loaded burritos and toasty nachos all prepared fresh upon order. To celebrate its opening, Taco Bell will organize a ‘Grand Public Opening Day’ on November 8. Be one of the lucky first 100 customers and have a signature Taco Bell crunchy taco on the house, a one-of-a-kind T-shirt indicating your place in the line, plus other exclusive, limited-edition Taco Bell merchandise! Taco Bell ATC also gives you more reasons to visit past the Grand Public Opening Day! Simply dine at the new store all throughout November and receive Taco Bell coupons with special deals that truly allow you to ‘Live Más’. Discounts, upgrades and a host of other amazing offers await its patrons. So what are you waiting for? 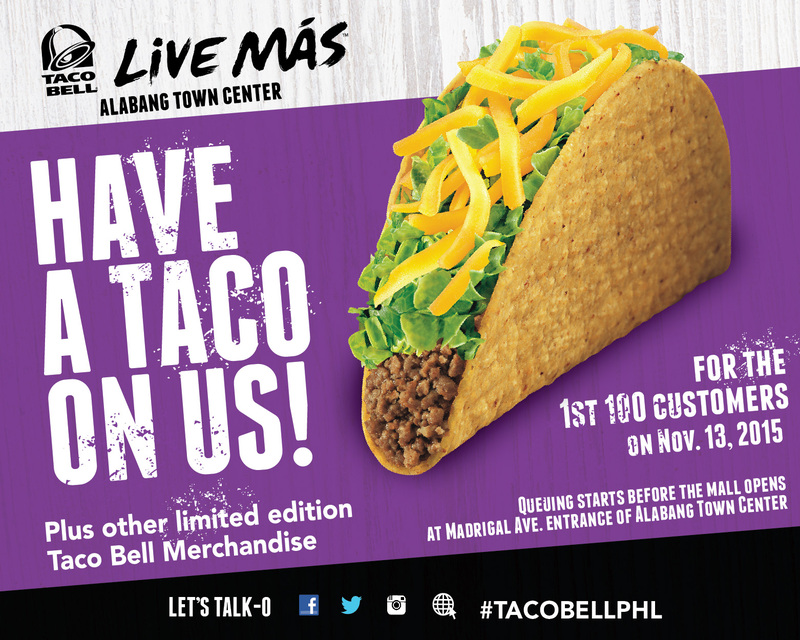 Head on over to the new Taco Bell branch in Alabang Town Center and revel in the ‘Live Más’ experience today! 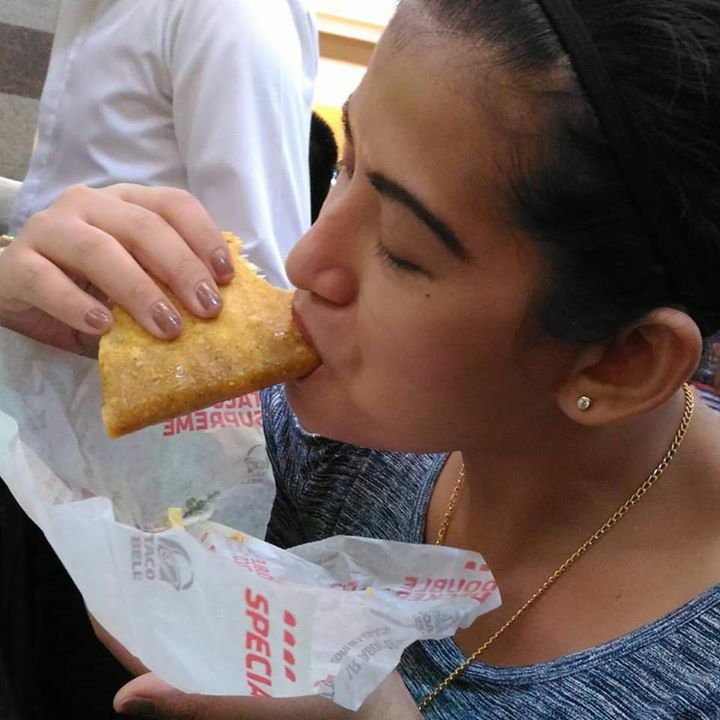 To know more about Taco Bell’s newest concept store, visit the official website at http://www.tacobell.com.ph. For special announcements on the ATC opening and other news from Taco Bell, “like” the official Facebook page at https://www.facebook.com/tacobellPHL and follow the official Instagram account @TacoBellPHL. Marriott has always had a soft spot for kids and this Christmas season, they wanted to share the love with more people and of course, more kids. 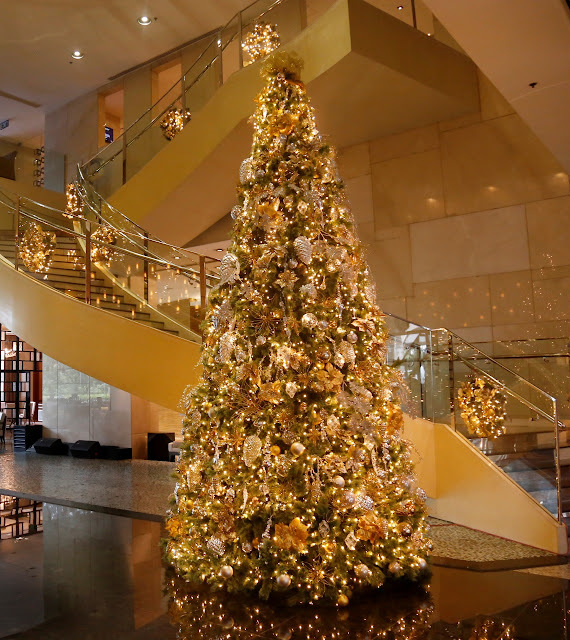 Smiles, songs, and a spread of feasts and treats were the highlights at the recently-held Christmas tree lighting at Marriott Hotel Manila. At 18 feet, its commanding height complemented the wide lobby staircase. Guests gathered around it while exchanging pleasantries with their friends and colleagues. Director of Marketing Communications Michelle Garcia welcomed everyone who started the holiday cheer at Marriott Hotel Manila and shared how this year’s celebration is more meaningful because of their partnership with Operation Smile. Together, they will provide free surgeries to children who have cleft lip, cleft palate, and other facial deformities. And to stress how Operation Smile has made a difference in the lives of the children, she introduced ChadleenLacdo-o, a former cleft palate patient of Operation Smile who is now an accomplished singer. Her rendition of “When You Believe” was inspiring from start to finish. With everyone in high spirits, General Manager Bruce Winton presented Marty, the reindeer. Every purchase of the stuffed reindeer toy (for only P500) will help raise funds for the surgery of kids of Operation Smile. Helping light the tree is one of the well-known celebrity families today, Kevin and Mitch Tan with their adorable baby Katleena Margaret. As soon as the lights begin to sparkle, a burst of harmonious angelic voices echoed through the lobby courtesy of HimigRoseña, the choral ambassador of Colegio de Santa Rosa-Makati. As everyone’s hearts lit with the true meaning of the season, CharicePempengco surprised everyone with a special song number followed by a grand entrance of Santa Claus, where kids excitedly lined up to whisper their Christmas wish and receive their early present. The merriment ensued with the lavish display of food prepared by the award-winning culinary team of Executive Chef MiekBrammer. There were white and red sauces for different kinds of pasta plus an assortment of meats and veggies which the guests chose according to their fancy. The live station also showcased the Smoked Bone-in Ham which is part of the Savory Package offered by the hotel for the festive season. Its honey-glazed skin and tender meat is perfect with the whipped potato and buttered corn on the side. Kids and the kids-at-heart kept going back to the dessert station which sampled the holiday treats at the Marriott Bakery. Guests grilled their own marshmallows and were free to add biscuits and chocolates. Marriott Hotel Manila has always been a happy place for business and vacation. 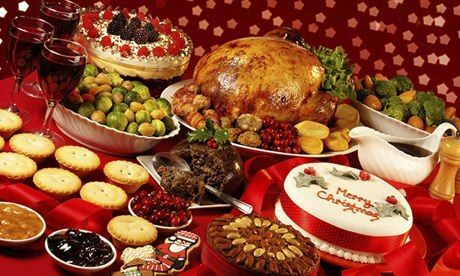 And whichever way guests choose to celebrate Christmas this year because of its festive feasts and treats, it is made more meaningful because Marty offers cheer―both for the giver and the happy child who will be able to smile along. 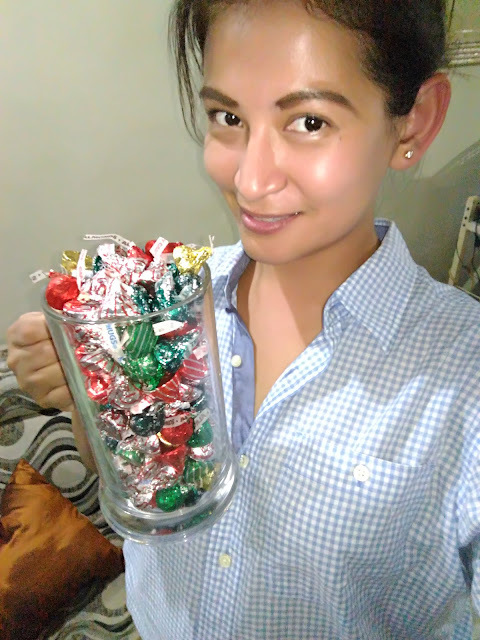 It is indeed the season to be jolly! For more information on Marriott’s Christmas offers please call 988 9999 or visit www.manilamarriott.com. If you read my twitter feed, you would know that I am addicted to TV shows and I can watch at least 20 TV series all at the same time and still remember what is happening to each one. I just love watching and sometimes, even imagining what if I am one of the characters on those TV shows. I am addicted. I even get super mad when friends would post spoilers. I feel that they deserve a special spot in hell for ruining moments. See, I just feel passionately about it. When I found out iFlix was getting bigger with more partners in tow, I just couldn't help but feel excited. After all, iFlix is one of the best mobile apps to use to watch some of my favorite shows on my phone especially when I am on the go and stuck in traffic. iflix, Southeast Asia’s leading Internet TV service, offering subscribers unlimited access to tens of thousands of hours of entertainment for a low monthly price, today welcomes Iza Calzado, Jasmine Curtis-Smith, Ruffa Gutierrez, Raymond Gutierrez, Richard Gutierrez, JM Rodriguez and Karylle Tatlonghari-Yuzon as shareholders of the Company¬¬ and partners in the business. This announcement follows a succession of landmark collaborations with industry leaders such as the Philippine Long Distance Telephone Company (PLDT), Smart Communications and Samsung Philippines. From starring roles in the country’s most iconic films to thriving music and acting careers, Iza, Jasmine, Ruffa, Raymond, Richard, JM and Karylle are prominent icons of the Philippine entertainment industry. Mark Britt, iflix Group Co-founder and CEO, says: “It is a tremendous honor to have exceptional celebrities of such caliber join us as shareholders. 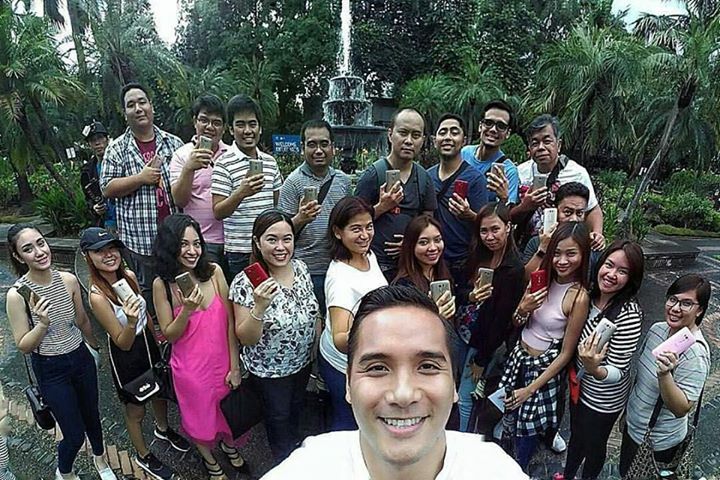 Now, along with our advisory board of Hollywood’s most elite executives, we have unquestionably one of the most formidable profiles and strongest networks in the entertainment industry both in the Philippines and internationally.” “At iflix, we are committed to working with the best partners in all areas from technology and content to marketing and distribution. These partnerships with the Philippines’ leading entertainment icons are a testament of this pledge. We look forward to benefiting from their tremendous experiences and wealth of knowledge about the entertainment industry in their role as our advisors,” Britt added. As partners in the business, Calzado, Curtis-Smith, Rodriguez and Tatlonghari-Yuzon, and the Gutierrez siblings will also play key roles in jointly developing projects for iflix original productions, as the Company moves forward with its plans for original content with committed budgets and negotiations with independent local producers and studios. 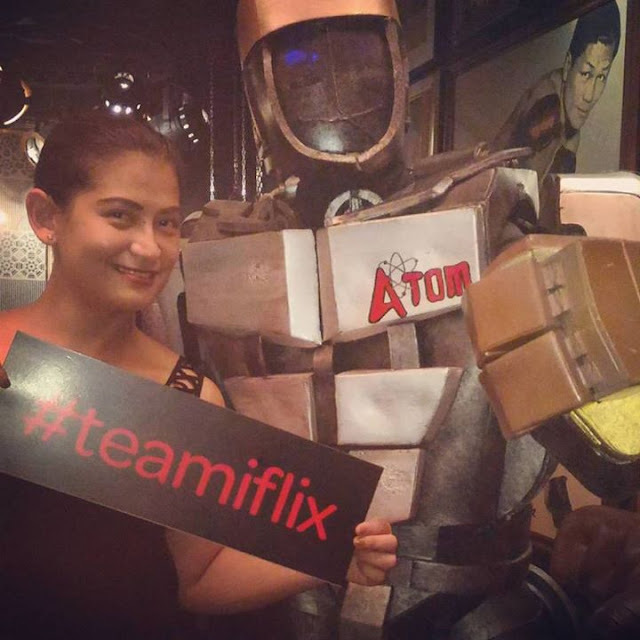 “I am so proud to be a part of the iflix family. They are doing an incredible job changing the way people are entertained throughout the Philippines, Asia, and soon - the world,” says award-winning singer and actress Karylle. 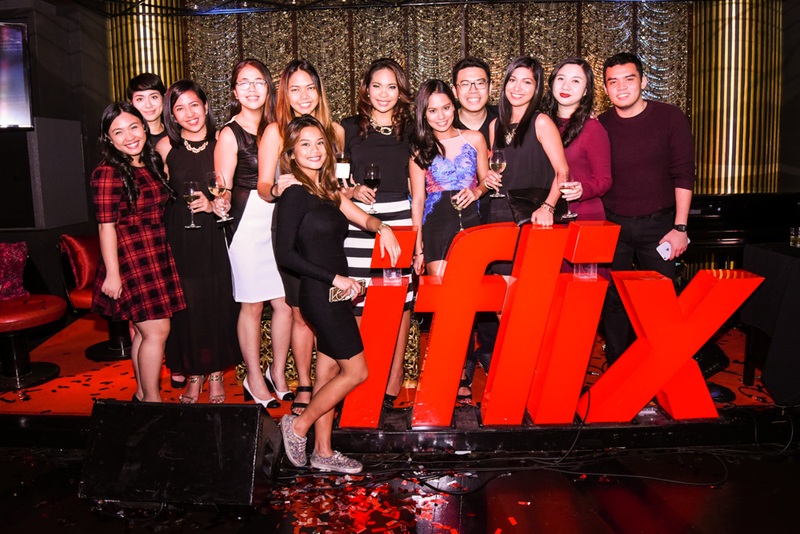 Now available in Malaysia, Thailand and the Philippines, iflix will continue to roll out its world-class service to additional key Southeast Asian markets in coming months. 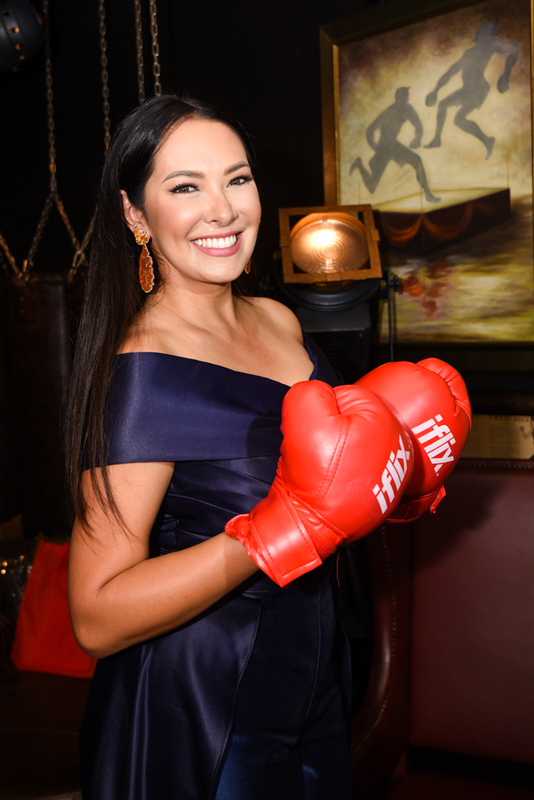 With over 750,000 subscribers five months since launching, iflix offers consumers the largest library of top Asian regional, and local TV shows and movies available in the region. Each subscription allows users to access the service on up to five devices, including mobiles, tablets, computers, and television sets, for viewing whenever, wherever. 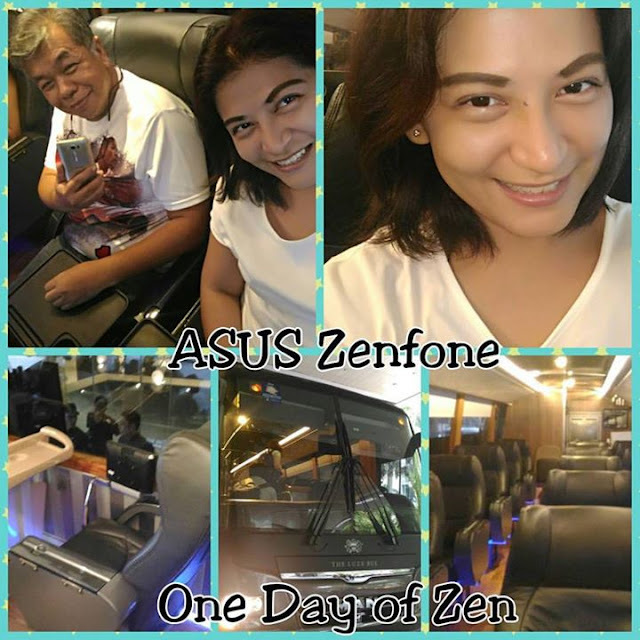 The service is affordably priced at only P129 per month in the Philippines for unlimited access. He wasn't a butcher when I met him. In fact, he worked at a pharma company. Perhaps this was why he took care of me. Pharma is medicine and meds are supposed to make you feel better right? It was what he would do for me before. He would always try to make me feel better. He made life easier and more comfortable. He would pick me up and take me around to my events. He would bring home my stuff so I wouldn't have a lot of things to carry. He would go with me and he was fine being my driver throughout the day. Just like a good pharma, he would bring out medicines to soothe my aches and wounds. When he flew off to the land down under, he became a butcher. When he became a butcher, it was like his personality also took on a different route. He became cold and distant. From wanting to make sure that I was always okay, it became all about him and his needs. From thinking of my comfort, it became his comfort and when he could make time. 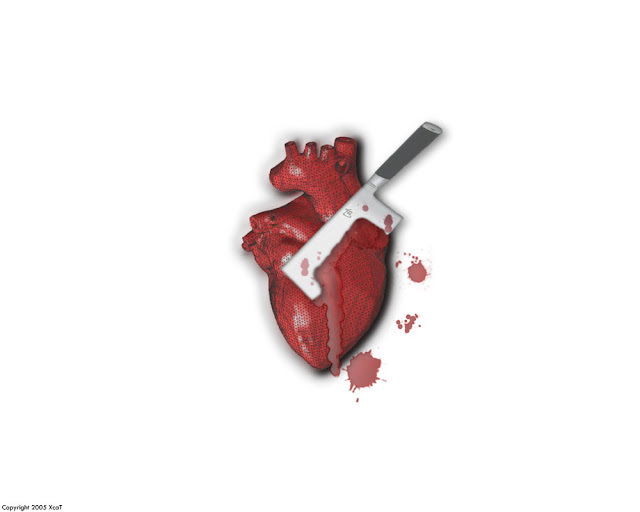 He became the butcher that cut my heart into pieces. He was the butcher that threw my body on a slab and proceeded to dissect me until there was nothing left. Afterward, he threw the remains without thought of how I would feel. He was done. It was over, just like that. I was nothing but a piece of trash and just like trash, he threw me away without thought, without warning, without care. I fell in love with a butcher and the butcher just broke my heart. I cannot live without my laptop. 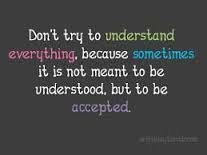 Yes, I am one of those people who say that and actually mean it. You see, my work is all online and with my laptop, I can easily do everything that I want to. My laptop is sort of my lifeline when it comes to making a living. However, when it conks out on me or gives me attitude, there is nothing more I'd like than to smash it or at the very least, rattle it a little in the hopes of making it work. If I do that though, it may just as well die. Thankfully, with the ASUS PRO lineup, I can now vent out my frustations on my laptop. Actually, with the new ASUS PRO lineup, I don't see the need for me to do any of that. The new line up is so durable. It is also very sleek, efficient, fast, and very stylish. It has both the aesthetic and the strength needed to run everything in perfect order. The laptop and the PC are both a must have for anyone who wanted to have something sleek and something very useful. ASUS today announced the launch of the ASUSPRO PC Lineup - a business centric PC solution catered to elevate and empower any business. With passion of improving businesses worldwide, ASUS PRO Series delivers above industry standard innovations in business notebooks such as Military Grade Durability, Smart and secure solutions, long battery life and ultra-portable designs for mobility.